Rookie fifth-round wide receiver Trent Taylor is being compared to former slot standout WR Wes Welker by San Francisco 49ers head coach Kyle Shanahan because of his impressive ability to create separation in small spaces, reports Chris Wesseling of NFL.com. Taylor led the NCAA in nearly every major slot category, receiving yards (3,839), receptions (294), touchdowns (29), targets (389), and routes (1,392) in the College PFF era (since 2014). 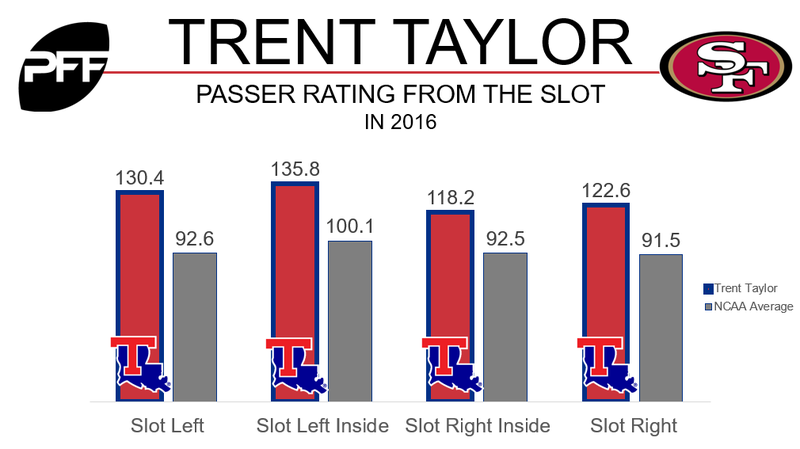 The former Louisiana Tech Bulldog had a threat percentage (the percentage of time a receiver is targeted when there is an aimed pass while the receiver is on the field) of 35 percent from the slot. The NCAA average in 2016 was 23 percent.